Environmentalists network after Bob Rae, former premier of Ontario and Craig Norris, CBC Radio host discussed World Water Day at UW on Mar. 22. 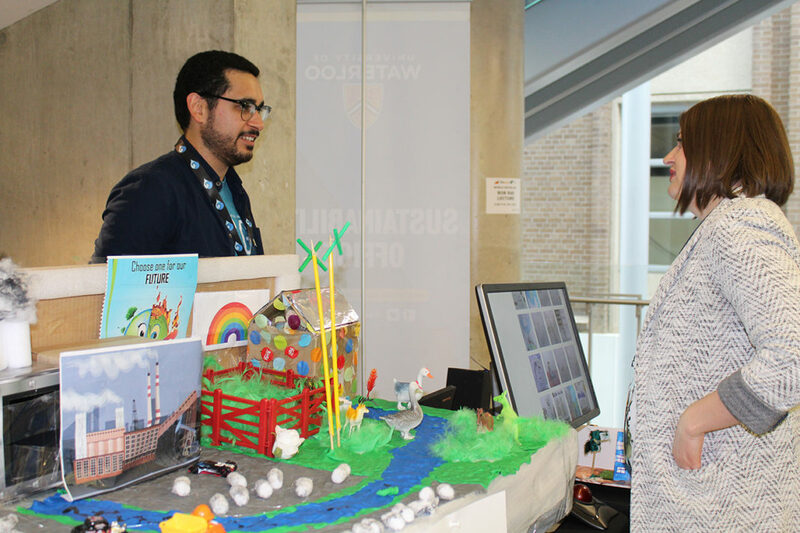 The Water Institute at the University of Waterloo celebrated UN-Water’s World Water Day on Mar. 22 at the Science Teaching Complex (STC). The event included various activities and a lecture delivered by former Ontario Premier Bob Rae and CBC Radio host Craig Norris on what the challenge of clean water tells us about ourselves, our country, and our planet. The activities were aimed at discovering solutions to provide clean water to marginalized people who do not have access to it at the moment. Attendees were given various opportunities to network and make connections with people who have similar interests. The first activity was a panel discussion to explore solutions to the Indigenous water crisis in Canada. The panel included Chief Linda Debassige, from the M’Chigeeng First Nation; Lydia Hwitsum, from the Cowhichan Nation; Deborah McGregor, from the Whitefish River First Nation; and Kelsey Leonard, from the Shinnecock Nation. The panel was moderated by Jean Andrey, dean of Environment. Once the discussion was over, many activities took place simultaneously. These included a career fair, poster exhibit, photography contest, several research videos, and lightning talks. Organizations like Matrix Solutions Inc., Canadian Water Network, and PolyGone [Technologies] came and set up pop-up exhibits to network and recruit. “We’re here today because PolyGone is a startup of Velocity Science at UW. We’re really excited to be here because we want to network with other people who are in the water space. PolyGone is focused on trying to standardize ways to quantify the amount of microplastics that can be found in water samples. We’re really excited to find out how other people are working in the space and to increase awareness of the problem, and let people [know] that we’re working on it,” Lorien Boyce, a PolyGone Technologies’ research and development assistant, said. “It feels great to be here. It’s an amazing opportunity to meet people who do similar work on water management. It’s great to interact with the younger generation,” Shoeleh Shams, research analyst at Canadian Water Network, said. There were about 150 attendees at the free event. “I’ve been to events like this one in the past and yeah, the turnout is great. It’s good to see the amount of people interested in the problem,” Boyce said. Students of the Water Institute Graduate Section were involved in the event with the goal of connecting those students who are interested in water-related issues.